Fights where Rogan showed the most excitement? Discussion in 'UFC Discussion' started by MMAAAM, Aug 9, 2016. 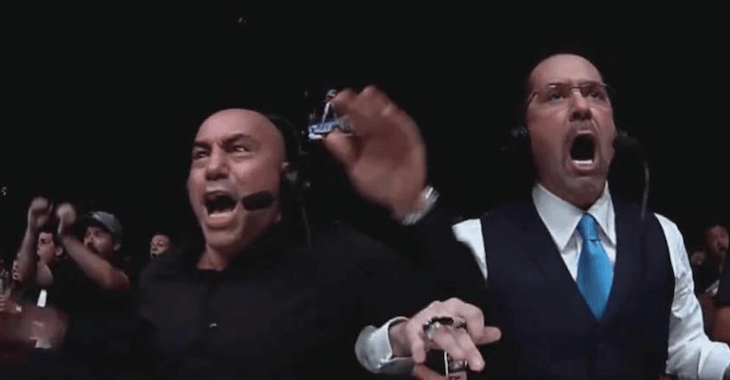 I don't think I have ever seen Rogan more excited than torwards the end of McGregor vs Diaz I. Do you remember any other fights where he freaked out even more? circa 09. everytime there's a rubberguard. omawho402 and SirKratos like this. omawho402, bootsy, TrainInVain and 6 others like this. Silva vs Weidman 1 ending is up there. Also Werdum vs Cain comes to mind. He is a huge fan of Silva and Cain so that probably explains some of it. He gets "excited" in all Ronda fights. TrainInVain and MMAAAM like this. KONE, hotcurlyweenie, Ken Fresno and 3 others like this. hotcurlyweenie and MMAAAM like this. "Once in a lifetime doesn't apply to Ronda Rousey. It's once EVER in human history." The Accuser, Fraz, TrainInVain and 4 others like this. He was saying some outrageous things at the end of Boetsch/Okami. Love Rogan though. trident and KONE like this. cigano, Ethan Rom, Haj01 and 3 others like this. Rogan almost jumped into the cage when Corey Hill broke his leg in half. The ref didn't notice the injury and didn't stop the fight right away, and Rogan was screaming hysterically at the ref to stop the fight. It was nuts, I've never seen anything like that before. All good ones. Funny I beat you to the Okami one. Haj01 and MMAAAM like this. Lol, I had never seen that. I was going crazy watching the Kongo fight.